I'm a subscriber and value your analysis. I know of, but do not follow EWT. EWT is one item on my check list when I receive my Buy/Sell signal. However, I disagree with you marking February 1011 high as end of wave 1. I believe February 2011 was wave 3 of 1. On 3/16/11, I received a short term buy signal which was similar to the short term signal I received on August 23, 2010. One difference, I also received short term sell signal on March 30, 2011. This usually does not happen with my system, unless this is ABC correction. I expect the SPX to go down once more and to break the 1256 closing before making new high as you indicated. My conclusion is that we are in wave 4 of 1.
very nice analisys, however I would like to ask you what consequences can we expect at the end of QE2. Last year we saw a strong correction 6 weeks after the end of QE1 that then opened the way to QE2...Can we expect the same this year? ( a 15/20% correction as many analysts expect?). Elliott Wave theory is always clear in hindesight, I would never put a penny on its suggestion on its own. I don't track what others say as most are forced to sell what they say due to lack real performance. The Inflation Mega-Trend ebook (Jan 2010) concluded that QE cannot end whilst large budget deficits exist. Therefore QE3 WILL follow QE2. Yes the gap between QE2 end and QE3 start will be volatile and corrections of 10-15% can take place, though 20% would be a bit extreme and not something that I am expecting. Exceptional work. Follow up to Andreas comments, what impact do you expect w/ end of qe2? Until the market finds out if govt will issue QE3, which will hard sell with faltering dollar, do you truly predict more upside? In my view, QE2 may not be successful, and if that is the case (and without QE3) to help reflate the u.s. economy i'd rather be in the camp that sees DOW in the 10K area rather than 13 or 14K. I find it very hard to believe that global growth will heavily expand as central banks begin to fight inflation and raise rates. The credit tightening is especially evident in the EM. Yes, there are many dark clouds out there such as the risk of QE failure, but that is why people never invest in the early stages of a bull market because there is so much evidence against why it should ever exist or continue. At the end of the day one needs to come to a conclusion based on the balance of probabilities and then put money on it, and then look for the trend to confirm or be stopped out of positions, that's all it boils down to in the end. Therefore I know I am right as long as my trading account balances continue to rise. I am eagerly awaiting your ebook, especially sections on market manipulation. Any idea when it will be available for download ? Excellent work as always, Nadeem! I have the same concern with Andreas and Jasper. Actually the market topped and started falling down almost immediately after the end of QE1 (3 weeks), which ended with the DOW below 10K. As QE2 will officially end in June, I am not as confident as you on that the first up trend will run into end August or early September. I know you will have more detailed analysis in the section of QE in your forthcoming ebook. I look forward to it. Thank you again for the excellent work! The ebook download will be emailed this weekend. and remember that forecasts are based on the sum of all analysis so individual factors such as QE can and do conflict against the final conclusion. With the Bull Market underway for 2011-2012, are you still 30% invested in the market? or have you changed the allocation to say 60% market, 40% cash? 11 Apr 11, 14:17 Ebook? It takes approx 15 hours of EXTRA time to convert analysis into an ebook, I had hoped to complete this during the weekend but it was not so. Just a few more hours work and it will be complete to email out, hopefully this evening. 60% in stocks !, that would give me sleepless nights ! It's all a question of managing risk, if worst comes to the worst, say a 50% crash, then I could live with an approx 14% loss, but 30% would be very painful! Is the rest in cash, gold, etc? The download url is in the latest newsletter, it takes approx 24 hours to process the whole mailing list, so you most probably should have recieved it by now, if not then within the next few hours. Stocks and commodities are high risk, I try not to go over 1/3rd though capital appreciation has pushed this to over 40%, hence why I sold my gold and silver perhaps a little early so that I can keep my oil investments. The rest in fixed rate bonds (I fixed at rates over 7% several years ago, for 3-5 years) and UK index linked bonds, and fair bit now in cash which is making me eye property for the first time in 5 years. i wanted to ask, how is the house price forecast looking? I admire your work immensely. You are one of the few analysts who actually understand the game in respect of the state and its ultimate intentions – witnessed by your calling for continued inflation as necessary for the goals of the modern state – goals that deflation would destroy, however. On Peak Oil I believe you are very wrong. I used to be a trader and once worked for Robert Prechter at Elliott Wave. Please don’t hold that against me. We fell out a long time ago over his long-term calls and his radical Aristotelian reductionist philosophy, leading as it does to blind Ayn Rand worship and a radical materialist reductionist philosophy. Bob suffers from a classic form of hubris. Perhaps that gives you an idea of where I am coming from. In any case, Peak Oil is a complete and total scam. There is enough oil in the world to last a million years and more is being made everyday. How you ask? For a start, Oil is not a fossil fuel. It does not come from dead dinosaurs or plants. It is ABIOTIC (do a google on Abiotic Oil – add Rockefeller if you like) meaning it is actually derived from deep within the earth and is part of its natural geological cycle. Calcium Carbonate and other material under immense pressure. This is why some oil fields thought ‘dead’ actually come back to life 20 or 30 years later. The Russians and Stalin knew that oil was not a fossil fuel and this ‘secret’ has been kept to keep the world financial system (and its corresponding political order) in power the past 100 years. It is a scientific fraud on a scale to make ‘global warming/climate change’ pale by comparison. The other part of the fraud is the keeping secret of major oil finds in various parts of the world over the past 60 years. There are oil fields in the USA and even off the coast of New Zealand that dwarf those of the middle east by many factors. If Abiotic Oil interests you, do some more research on the ‘expanding earth’ theory. This theory explains a lot about the geological process actually works. Ps. Don’t look at the sources on Wiki – a controlled asset just like Assange – you need to do some digging – here are some links to start you off. There have been many times when I have thought a trend has been in force because of one thing when in hindsight it has turned out to be something completely else, which is why I don't put too much weight behind any single point or theory of analysis i.e. on its own its not much more than a 50/50 proposition. 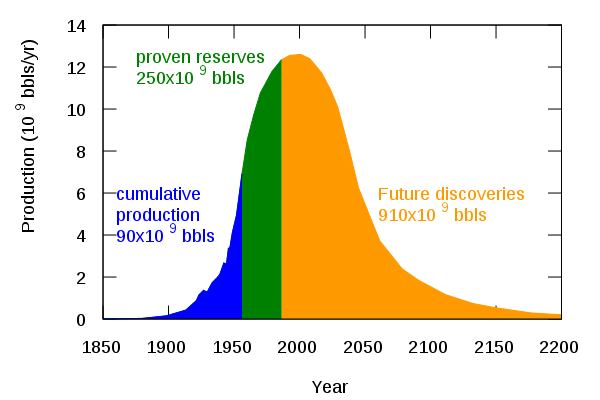 I have looked into Abiotic oil several times in the past and on the balance of probabilities discounted in favour of fossil fuels, therefore supporting peak oil theory, as most importantly it is supported by oil price action and rising oil stock prices / dividends. And I don't buy global theories of conspiracy of silence over vast oil reserves because the governments are too incompetent and the financial industry too greedy for this to have been sustained even for a minute let alone for decades. In fact EVERY mineral and resource on earth is finite and priced according to its scarcity and supply. Which is why price is king. No ONE can hide the truth from the market price. The bottom line is that all that matters is the price - and the price supports peak oil theory, which means VERY HIGH INFLATION, all manifestations of the unfolding inflation mega-trend. About 2 months away, until then the last stands for a multi-year UK housing market depression. Is it possible to bring your secrets to trading success ebook forward from later this year? I won't have the time to start it until August. There is a big difference between the last 3 ebooks and one on trading as the analysis for the former were necessary in managing my portfolio whereas a trading ebook would be 100% surplus to my own requirements therefore all extra work.